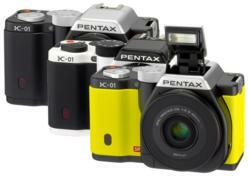 PENTAX RICOH IMAGING AMERICAS CORPORATION is pleased to announce that the PENTAX K-01 interchangeable lens camera (ILC), designed by world-renowned industrial designer Marc Newson and launched in March 2012, has been selected as a Product Design 2012 winner at this year’s prestigious red dot design awards in Germany. Sponsored by the Nordrhein Westfalen Design Center in Germany, the red dot design awards are one of the world’s most prestigious design awards. Each year, products brought to market over the previous two years are judged on nine different design criteria, including degree of innovation, functionality, ergonomics, durability and ecological compatibility. The PENTAX K-01 was selected from more than 4,500 applicants from 58 countries as a Product Design winner in the "Entertainment Technology and Cameras" category. The PENTAX K-01 is an interchangeable lens camera with super-high-resolution image quality supported by approximately 16.28 effective megapixels, a top sensitivity of ISO 25600, and full HD video recording capability. The clean, geometric Marc Newson-designed camera body signifies a bold move by PENTAX to create a high-quality camera within a truly original and innovative design. By incorporating the K-mount — a lens mount extremely popular from the days of film cameras -- this award-winning camera would be compatible with 25+ million PENTAX K-mount lenses spanning decades, assuring endless possibilities in visual expression and creativity.